When a loved one passes away suddenly in an unforeseen and tragic accident, it feels like the wind is knocked out of you. You may struggle with who you can turn to and what steps to take to ensure you obtain justice for your loved one and the compensation needed for your family’s future. Here are a few steps to take after the unexpected wrongful death of a loved one. When you first learn of your loved one’s accident and subsequent death, surround yourself with friends and family members. They can help support you and help guide you through basic day-to-day motions while you’re coping with sudden tragedy. Depending on how you choose to honor your loved one, either through burial or cremation, planning their memorial service is something that must be done fairly quickly or can be scheduled out for after you’ve had some time to begin coping with your loss. Don’t let anyone pressure you into making decisions for your loved one’s service that would make things difficult for you or would go against the wishes of your loved one. Losing a loved one is never easy, and it can be even more devastating when it’s your spouse or even your child. Coping with the accident and their absence may be more than you can process alone. Consider finding a grief support group or a counselor who can help you through the first months and years. Gathering evidence of your loved one’s accident while you’re still grieving can be challenging, but the truth is, you’ll never stop grieving your loved one — you will always miss them. However, evidence of the accident can be tampered with, mishandled, or lost, potentially compromising justice for your loved one. Start getting evidence together as soon as you can, even if it’s difficult. Or, appoint a trusted family member to do so for you. If your loved one’s death was caused by carelessness or negligence, the person(s) responsible should be held accountable for their action or inaction. Your loved one deserves justice and compensation can help you cover many of the financial burdens your family will face now and in the future. 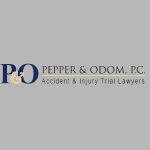 Contact Pepper & Odom, PC to learn more about wrongful death lawsuits by calling 601-202-1111 or 205-250-1107.